Power lines, which deviate much beyond normal voltages can damage expensive electronic equipment. 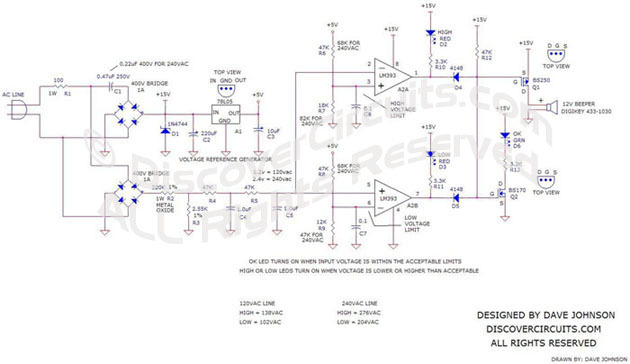 The circuit below sounds an alarm whenever the line voltage is higher or lower than normal. I set the alarm limits at about +-15% from standard levels. The circuit rectifies and filters the power line signal. I set the resistor values, so the DC voltage produced is close to 1% of the RMS value of the line. Thus, a 120vac line would yield about 1.2v DC. That voltage is fed to a pair of voltage comparators. The outputs of the comparators decide if the sampled voltage is above, below or acceptable. Three LEDs indicate the voltage range. A green LED is lit if the voltage is OK. If the voltage is outside normal levels, the circuit sounds an alarm using a small magnet or piezoelectric beeper. I have shown recommended resistor values for both 120vac and 240vac power lines.